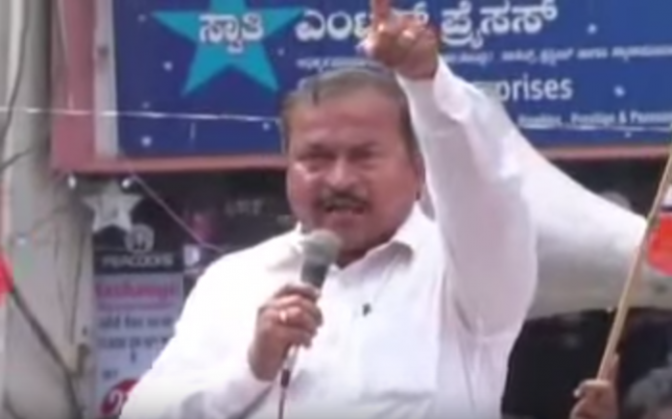 SN Chanabasappa, a senior BJP leader in Karnataka's Shimoga has openly threatened to "behead" state chief minister Siddaramaiah for making a statement that he will eat beef. "If Siddaramaiah has guts, let him come to Shimoga and eat beef. If he thinks we will spare him, he's wrong. Let him kill a cow and show, we will separate his head from his body and play football with it," Chanabasappa was quoted as saying, in a Hindustan Times report. This comes after the CM made a statement that it was his right to eat beef and that nobody could stop him. Meanwhile, based on a complaint by district Congress president, Prasanna Kumar Shimoga police has registered a case of criminal intimidation against Channabasappa. However, the latter is unperturbed. Channabasappa believes that the constitution which holds the cow as holy, will protect him. Here's a video of him threatening the CM.